Eunice Hill a longtime resident of Ladonia, Texas passed on February 7, 2019. A Celebration of Life will be held at the First United Methodist Church of Ladonia on Saturday March 16, 2019. Lunch will be served from 11:00 to 1:00. Her family invites you to come share this time and your favorite Eunice story. She was born Eunice Harriet Broms in Fargo, North Dakota on June 27, 1924. She spoke often of her days in the north and was especially proud of her Swedish heritage. Eunice left Fargo because she met Billy Hill from Ladonia, Texas. They were each working in Minnesota and rode the same city bus. One day he asked if he could pay her fare and sit with her. He did both and before the ride was over, she had given him her phone number. Eunice transferred with Western Union to Dallas to be near Billy Hill. They married in 1945 on her 21st birthday. Together they owned and operated Billy’s Grocery Store. Wm. F. (Billy) Hill died August 11, 1963. At that time, Eunice took her husband’s seat on the Board of Directors at Farmers and Merchants State Bank which would become Quadco Bank Shares Holding Company. She served on the Board for thirty years and also worked at Commerce Savings and Loan until her retirement. 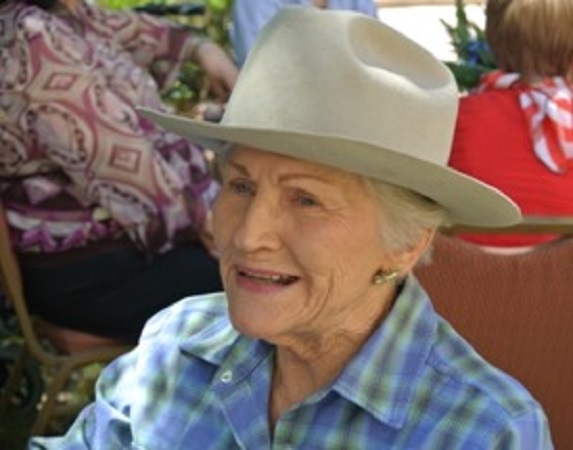 At the age of 80, Eunice moved to Austin, Texas. At 94, Eunice had seen a lot of the world. Mexico, Turkey, China, Europe, Panama Canal. One of her absolute favorite trips was an Alaskan cruise. And her favorite traveling companion Lois Amundsen who took pages of notes to go with Eunice’s pictures. The traveling duo also participated with the Paris, Texas Sweet Adelines. Eunice created prize-winning art and proudly displayed the framed work on her living room walls. Being a bit competitive, Eunice loved games and especially Bingo, Mexican Train and Solitaire. She was a master of the jigsaw puzzle and always started with the border. Beautiful, intelligent, and spunky, Eunice Harriet Broms Hill lived a full and rich life. She was a friend to many, but most of all a loving daughter, sister, aunt, wife, mother, and grandmother. She is survived by her son Bobby Hill and wife Kathy Hill, her daughter Marilyn Hill-Henderson and husband Lex Henderson. Also her grandchildren Zac Henderson and wife Kate Smallwood, Jennifer Ward and husband Scott, and Robert Hill and Anna Kim. In memory of Eunice, a donation may be made to the Ladonia Cemetery Association, or the First United Methodist Church of Ladonia. I have such wonderful memories of Eunice (it took me a long time to call her Eunice vs. Ms. Hill), including a ski trip when we were roommates. She was a remarkable woman who had many great adventures and accomplished so much in her life. Her smile was radiant, her humor delightful and she always welcomed Marilyn’s friends into her home and made us feel so welcome.